"I swear to God I will break your legs." So this is not the Game that was live Tweeted on March 23, 2014. This was a small prologue that I did with Adam for his run at DM - much like the games I did with Jeff and Dave in Elementia Game 1 and Conquest of Frey Game 1. The next Oriental Adventures Campaign will be out soon! This was Adam's first time DMing using the rules, and my first time playing 1st Ed AD&D as a player. It was an interesting and fun experience! I played as Hiroyuki Yamashita, my Sohei, and Adam began my tale by taking me back to a moment from my childhood. 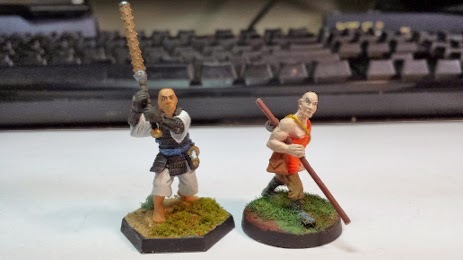 Yamashita and his twin brother Jo-on, Elijah's monk character, had been left on the steps of the monastery while still in the cradle, and had been raised to live the life of monks ever since. Yamashita was 14, and already realizing that the life of a monk was not for him. Jo-on, on the other hand had taken to the life like a fish to water. A small rift had grown between the two, as Jo-on's mastery of their studies had compelled him to take an arrogant attitude of superiority towards Yamashita. But today, Yamashita was going to go on a journey that would set him on the right path in life. Scene 1 The Grand Master's Letter. Yamashita had been given a letter to take to his brother. It was sealed by the Grandmaster, but had a peculiar weight as if something more than paper was inside. Annoyed that he was playing messenger to his brother, he considered for a moment opening the letter and reading it for himself. However a life of training could not be ignored, and protocol got the better of him, so he set out to find his brother as quickly as he could, wanting to get the task over with. He found Jo-on meditating among the gardens, seeming peaceful and serene. He was annoyed at Yamashita's approached, but took the letter from him, snatching it from his hands. He read it, his face telling Yamashita nothing, and then said it instructed them to go and see the Grand Master himself. The Grand Master was doing his calligraphy in his study when the twins found him. He bowed to them and they bowed politely in return, and told them there was a scroll in the catacombs underneath the temple that he needed them to get for him. Both Jo-on and Yamashita knew of the Sohei guarded entrance to the chambers below, and this was almost a childhood dream come true: to finally see what was down there. Jo-on, the Grand Master said, was along to identify the scroll, Yamashita was along for protection as there were some creatures down their that would not take kindly to be disturbed. Outside the Grand Master's study, Jo-on revealed that the letter he had given them had the key to the catacombs and off they went. Scene 2 The Chambers under the Monastery. The Giant Rats. The door to the catacombs was guarded by a large but friendly Sohei named Goya. The twins chatted with him for a bit, but he didn't know what was down there. Not wanting to waste any more time, Jo-on unlocked the door and he and Yamashita headed down a long stair case. The ground was immaculately kept free of dust, but the musty smell of eons past clung in the air. At the bottom of the stairs was a long corridor, that Yamashita heard some faint rustling coming from, but he saw nothing he could make out clearly. Side by side Jo-on and he walked down the hall, until two rats the size of small dogs leaped out at them from the darkness. Jo-on was bitten, but they were able to kill both rats and moved on. Scene 3 The Singing Bowl. The first room the twins came to was circular and brightly lit with torches. Three doors stood on the walls; one to the left, one in front and one to the right. In the center of the room there was a large metal bowl that sat on a pillow. Yamashita exclaimed that he had no idea what it was, to which Jo-on scoffed. He said it was a Singing Bowl, and that a mallet could make it sing. Thinking he had it figured out, Yamashita used the stick he was carrying to make the bowl sing, but it hardly made a sound. In frustration Yamashita then hit the bowl with his stick causing a large clang. Jo-on looked at Yamashita with disgust calling him a brute. He continued to belittle him saying, that they needed to find a special mallet, and only an idiot wouldn't recognize that. And that is where the Quote of the Evening came from. Fed up with the abuse, Yamashita held up the stick he carried, and threatened to break Jo-on's legs with it if he didn't stop with the criticism. It silenced him for the time being. Scene 4 More Rats! And then Bats! Yamashita decided to travel down the left passage, and asked Jo-on to grab a torch. As they soon as they walked down the corridor, they were attacked by another pack of rats! The twins defeated them, but the creatures had started to take their toll on the two low level character's limited health points. Despite this, the dungeon was unrelenting! After rounding a bend, the light from the torch disturbed a nest of bats, two of which attacked them. The fight between the twins and the bats went on forever! Yamashita quickly finished the first one, but the second one swooped about with murderous intent, always just out of their reach. Yamashita broke his stick and was swinging at the creature with his fists, when finally - after about 10 rounds of combat - Jo-on plucked it from the sky and threw it to the ground dead. Each made sure the other brother had not been seriously injured (which they weren't, but HP was getting low) and then continued on. Scene 5 The Wrath of the Fish! Making the Bowl Sing. As Yamashita and Jo-on found their way out of the corridor they ended up in another circular room with a singing bowl. This room had an open archway and another door which was locked. Inside there was a short hall that had been mostly flooded with water, about knee high in depth. On the other side of the water was a pedestal that held a mallet: the kind that would make the bowl sing! After that the twins returned to the first singing bowl they encountered and used the mallet to make it sing. A terrible, off key squeak rang out from the bowl. It was the wrong mallet. This mallet was for a different bowl! Sighing, they returned to the other singing bowl they had found and made it sing. The note rang perfectly on key, and the sound opened the locked door that stood beside the open archway to the flooded mallet room. Through the locked door, Yamashita and Jo-on found a chamber full of scrolls. There were shelves of them, barrels of them, boxes of them! And, after looking around for a bit Yamashita noticed there were some other interesting items as well: some spears, armour, katanas, tons of things! It would seem that they had reached where the Grand Master's scroll would be, so Jo-on went about his work identifying the correct one, a task Yamashita did not envy. After a moment's search, the twins heard a rustling from the back corner. They were attacked by both rats and bats, and neither Yamashita or Jo-on had much health left. They managed to push back the rats, but the bats proved to be too much. Yamashita had one hit point left, and Jo-on was down, with the bats swarming around him. It was at that point that Yamashita realized his purpose in life. He had to protect his brother, and he would protect any monk in trouble. Looking around him, Yamashita saw the long handle of a tetsubo and he pulled it from the barrel. Having a real weapon in his hands for the first time gave Yamashita a sense of elation. Thus for the purpose of this battle, the tetsubo cast a maximized level 1 Cure Light Wounds spell on Yamashita, and counted as a +2 tetsubo. Yamashita then charged at the bats swinging and striking some as the others ripped at his skin. After a few swings, he drove the bats away from his brother. As the last bat fell to the ground, Yamashita only had 1 HP left. The last thing he saw before he passed out was his brother Jo-on roll over, at least he was alive. Yamashita awoke in a bed in the infirmary. Jo-on was lying in another bed near by. He thought for minute that it may have all been a dream, but then rolled over to see the tetsubo leaning against his bed and the Grand Master sitting beside him. The Grand Master told Yamashita that Jo-on had regained consciousness and gotten help, saving his life. But, he also said that Yamashita had saved both of their lives by fighting away the bats. So the Grand Master had decided that from now on Yamashita was to be trained as a warrior by the Soheis. And that is that tale of how Hiroyuki Yamashita became a Sohei and came to trust the tetsubo. It was a great game, and it would only get better!